Thank you for choosing to support Ozanam Charitable Pharmacy. For every dollar you donate, we can distribute $6 in necessary medicine to those in need right here in Mobile, Baldwin and Escambia counties. 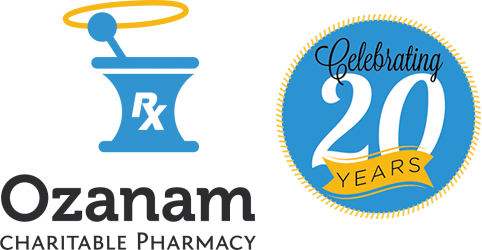 Ozanam Charitable Pharmacy’s primary mission is to provide affordable and appropriate pharmacy services* and to coordinate access to health care for people who are vulnerable** in our community. *Pharmacy Services: Medicines and necessary services to ensure optimum clinical outcomes. **Vulnerable: Those living at or below 200% of the Federal Povery Level who are uninsured or underinsured for prescription medications. Donations in memory of or in honor of loved ones and friends are welcomed. Start your Amazon online shopping at www.smile.amazon.com and choose Ozanam Charitable Pharmacy as your designated charity. We will receive a portion of each purchase made from this site. You can sign up as a donor and register your credit or debit card to round up purchases to support Ozanam at www.caringcent.com. This is the spare change jar of the 21st century! Your spare change makes a difference in the lives of our patients. It is safe and easy, and you can control how much you wish to donate. All donations are tracked, and tax receipts are issued. Register to run or walk for Ozanam at www.thecharitychase.com.